SERIAL NUMBERS can be marked on metal parts - in a simple operation. Special design ensures that numbers advance one - at - a time accurately and automatically. Impressions are perfectly aligned, evenly spaced, uniformly deep - Component after component ! Numerators with Alpha - Numeric and / or special wheel combination. High Performance Numerators for longer life. Composite Numerators with provision to mark Logo or Repeated fixed data along with serial numbers. 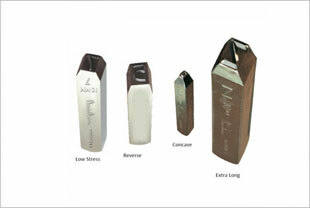 Numerators for marking at Red Hot temperature or Numerator with Heating arrangement. Wheels made from special Tool Steel. Cam material as durable as stamping characters. Extra wide unit wheel for longer life. One - piece actuating pawl machined from solid bar. No riveted assembly - easy to dismantle and clean by user. Unique design of holding catch and springs. Perfect for part numbers or Code numbers marking by hand stamping on Casing, Steel, Brass, Aluminium. 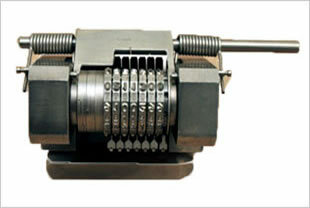 Rotary Type Numerators with wheel combinations of Alpha - Numeric Wheels. Rotary Type Numerators with provision to mark Logo / fixed Letters along with numbers. Speical Numerators with Concave / Convex wheels to Mark on Curved surfaces. Special wheels for Hot Stamping. Numerators with special Calligraphy other than “Bradma” Calligraphy. Rotary Type Numerators with more than 6 Wheels. Each ‘Marking wheel has 11 faces with 0 to 9 figures on 10 faces, and one face blank. Marking Wheel can be rotated to any desired position, then locked positively by a locking pin. Individual wheel release : One wheel can be released at a time, without disturbing set - up of other wheels ( The locking pin can be pulled to release just that paricular wheel. No loose parts. The unit is complete, compact and sturdy; ready to use.